LPG MOBILE TANK can be Designed as per customers requirements. Globe Gas is manufacturing Liquid Petroleum Gas (LPG) Road Tankers and have been supplying many of the major oil companies in India/Africa/Nepal & Bangladesh. You can trust that our products are built to the compliance of the top oil companies standards. Our LPG Tankers are designed to meet ASME Sec VIII Div 2 standards. Our Road tankers are equipped with reputable and reliable components. Globe Gas offers LPG Tanker in sizes typically range from 8MT to 21 MT, which are typically chosen depending on the road regulations in each country and the level of productivity of the users. The common standards met by our LPG tanks include the American standard (ASME). 7.5 MT LPG Mobile Tank - Fixed Cabin Chassis. 12 MT LPG Mobile Tank - Fixed Cabin Chassis. 18 MT LPG Mobile Tank - Double Axle Running Gear. 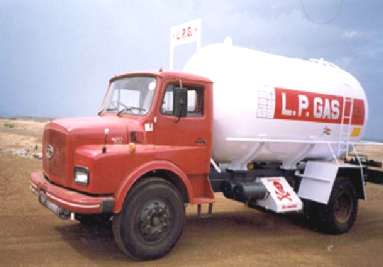 21 MT LPG Mobile Tank - Triple Axle Running Gear. Road Tanker are provided with Stairs/Sun Shield & Tool Box. 903, Corporate Avenue, Sonawala Road, Goregaon (E), Mumbai 400063. INDIA. ï¿½ GLOBE GAS EQUIPMENTS INDUSTRY PVT. LTD.